The Apple Farm is situated within easy reach of four different mountain ranges which provide a great variety of walking and climbing opportunities for the visitor. The biggest of these ranges is the Galtees which extends for about twenty four kilometres west of Cahir into County Limerick. The highest point at 919 metres is Galtymore and there are several other peaks above 800 metres. There are five lakes in the Galtees, all on the northern side of the range, and the largest of these, Lake Muskry, is a popular destination for walkers. The southern side of the mountain has more gentle slopes than the northern side and here you will find many opportunities for walking in places such as Glengarra Wood and the Blackrock Valley. Just north of the Galtees is a long low hill known as the Slievenamuck Ridge and the valley between is the well known Glen of Aherlow. Here you will find a nature park with marked trails as well as other woodland paths providing good views of the Galtees and the surrounding countryside. The Knockmealdown mountains lie on the Tipperary Waterford border. The best known part of this range is 'The Vee', so called because of the hairpin bend on the Clogheen to Lismore road which passes over the mountain. There are a number of parking places on this road which provide great views of the surrounding countryside as well as a mountain lake known as Bay Lough. Because there are a number of roads through the mountain access for walking is easy and the Knockmeldowns also contain several waymarked walking routes. 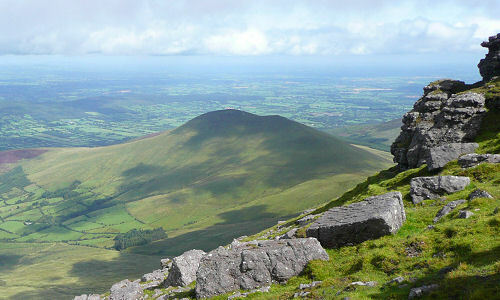 The highest point is Knockmealdown mountain at 794 metres. On the southern side of the mountain there's a Cistercian monastery known as Mount Melleray. Although the Comeragh range is in County Waterford it is still only a short distance from The Apple Farm. It stretches from Clonmel at the northern end to Dungarvan at the south and provides a wide variety of terrain for the walker. To the north, near Clonmel, there are rolling hills and forest trails. On the western side is the well known and beautiful Nire Valley which is a popular access point to the mountains. The eastern side has a number of corrie lakes backed by high cliffs, the largest lake being Coumshingaun. Farther south is a wonderful valley topped by a high waterfall known as Mahon Falls. Access to the falls is easy and this place is well worth a visit. Slievenamon, or the 'Mountain of the Women' in Irish, is the only nearby mountain completely within County Tipperary. It is located north-east of Clonmel and is different to the other ranges in that it doesn't have a large number of individual peaks and is much rounder in appearance. The main walking trail on this mountain is from just north of the village of Kilcash to the summit at 721 metres. A local group, The Galtee Walking Club, provide walks on all the local mountain ranges on Sundays throughout the year and on Wednesday evenings during the summer.